A hand-blown sculpture with organic appeal. Welcome this sweet pea into your pad. 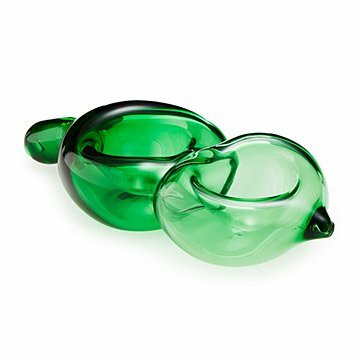 A modern sculpture with organic appeal, each oversized pea pod is hand-blown by William Couig. The artist uses a torch to shape the molten glass and create recessed areas that can hold decorative objects, grab-and-go fruit, or party snacks. Hand-blown in New York. William Couig was introduced to glass after seeing demonstrations of the craft as he backpacked around the world after college. Upon returning to New York City, he joined a glass art studio and has spent the past 15 years creating sculptures using traditional techniques and glass' natural attributes to bring ideas to life. He's become a constant presence in the New York design landscape, completing a variety of commercial projects and developing lines for high-end companies. Wash with soft cloth and glass cleaner.